A busy, and big hearted ski resort. Situated in the western part of Switzerland’s Bernese Oberland, Gstaad offers visitors a peaceful, rustic alpine village. A popular mountain destination for many decades, Gstaad is the epicenter of the “Gstaad Super Ski Region,”a conveniently laid-out interconnected resort system comprised of six areas. The Gstaad Super Ski Region whisks skiers and snowboarders uphill via 53 lifts—10 gondolas, four trams, 17 chairlifts and 22 surface lifts—which accesses 136 miles spread over 103 pistes. Purchasing the regional lift ticket is the way to go. The lift ticket not only affords access to Gstaad and the other Super Ski Region resorts, but also includes transportation on local connections, like railroads and buse,s and entrance to the municipal indoor swimming pool. Despite its renown as a well-heeled destination, Gstaad offers ample affordable lodging options and lift tickets are no more expensive than the rest. The area accommodates about 3,000 hotel beds, and when combined with the resort’s uphill capacity of 51,000 skiers an hour, you can bet you’ll often have trails completely to yourself. A large selection of exclusive gear shops, boutiques and pastry shops make afternoon shopping a delight. The region offers eight ski schools with over 200 ski teachers, 74 miles of cross-country skiing trails, ski touring and heli-skiing. In addition, you’ll find outdoor curling and ice-skating, three miles of sledding trails, swimming pools, indoor tennis courts and much more. The nightlife will suit every taste, from hot discos to piano bars and night clubs. If you prefer to explore historical sites, Chateau d’ Oex, a beautifully married village of Swiss and French influence, is only half an hour away by train. Gstaad skiing is best reserved for intermediate skiers and families, since the majority of the runs are red or blue. Seasoned skiers and snowboarders might be a touch disappointed with the resort’s lift-accessed expert skiing, however, they will be pleased to learn that Gstaad offers three heli-skiing tour operators and six landing zones. 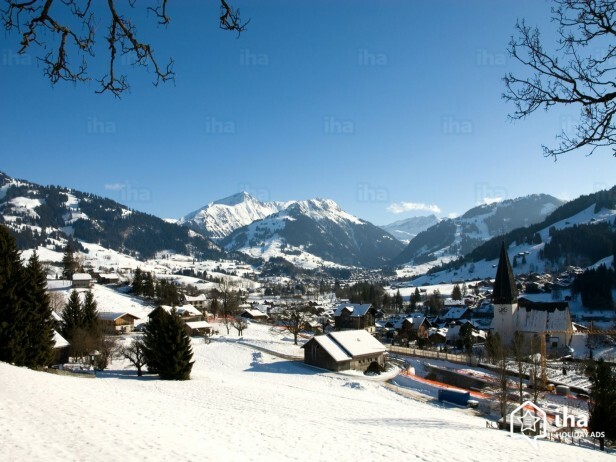 The closest airport for ease of access to Gstaad is Sion at 25 miles away. A 6 seat Cessna Citation CJ2 jet from London toSion is approximately 1 hour 25 minutes. A larger 8 seat Cessna Citation XLS will complete the journey in 1 hour 20 minutes. The Drive time will take approximately 1 hour 30 minutes due to the mountain climb. A helicopter will get you to resort in 30 minutes. Arranging a private jet charter or helicopter transfer with Freedom Air to arrive in style to Gstaad is simple. The Freedom Air team can be reached on +44 (0) 1275 548001 to book your next trip.